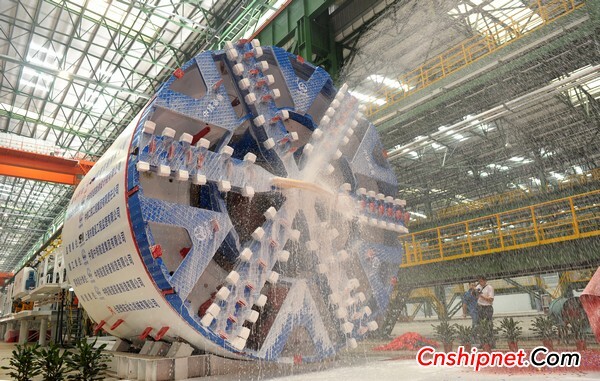 August 21, after manufacturing and installation of more than six months of commissioning, Hefei Rong An Power Machinery Co., Ltd. and China Railway Tunnel Equipment Manufacturing Co., Ltd. (hereinafter referred to as: Railway equipment) co-production of the first tunnel boring machine in RongAn power The structure workshop was officially offline. The downline of the shield machine has filled the blank of Anhui's major equipment manufacturing industry in this field, and laid a solid foundation for the new situation of Rong'an Power to develop diversified operations. The shield machine model is an electric drive composite earth pressure balance shield with an excavation diameter of 6280mm. The equipment consists of a main machine, a 1-section equipment bridge and a 6-section trailer. The total length is about 80 meters, the total weight of the shield machine is about 500 tons, and the single piece weighs 110 tons. The maximum size of a single piece is 6280mm Ã— 2800mm. The full name shield tunneling machine of the shield machine is a high-tech tunnel construction equipment that integrates light, electricity, liquid, sensing, information and other multi-door technologies to realize the molding, transportation, support and lining. It has high automation, manpower saving, fast construction speed, one hole, no weather influence, can effectively control ground subsidence during excavation, reduce the impact on ground buildings and does not affect surface traffic during underwater excavation. Features. Next: Around the world, the â€œEmperor's Brotherâ€ deeds are commonplace and ordinary citizens continue to write extraordinary legends.